"standard by the mile, custom by the foot." Multi-Conveyor is a standard plastic chain or plastic belt conveyor equipment manufacturer and a specialty custom conveyor manufacturer. Although we're known for custom conveyor solutions, our standard conveyors are probably the most economical, quick-ship systems on the market today. We specialize in engineered products with integration, turn-key, electrical and service capabilities. We are a leader in the industry for what we do. This is not an opinion or a debate - simply a humble fact. We have a track record of thousands of quality conveying and industrial conveyor systems. Their value is proven across multiple industries including Automotive, Beverage/Bottling, Dairy, Food, Household Products, Personal Care, Pharmaceutical/Nutraceuticals, Industrial and beyond. Multi-Conveyor excels in sanitary, washdown, food grade and agency compliant stainless steel conveyor systems. Many are designed specifically to work in conjunction with metal detection systems, frozen or baked products, and raw or packaged goods. We build machines that will transfer, rotate, elevate, grip, accumulate, flip, index, align, merge, divert, sort and more. Our engineers, designers, and technicians bring forth concepts and solutions that get results and gain efficiency from state-of-the-art controls to UL certified paneling and PLC programming. In fact, chances are that we've already concepted, designed and built a conveyor or device similar to the one you need for that project you're working on right now ... or, made one pretty damn close. As a conveyor manufacturer, our profile is full-service, from design to installation including start-up assistance while maintaining your timing and delivery requests. This means "problems solved the first time" for plant managers. From complete systems to turn-key projects, we have the answers. The objective is plain and simple: Your best, conveyed better. Or, send your RFQ now! Come work at Multi-Conveyor. You'll love it here! Craft Brewers - Let's Move Some Beer! empty or full- we can help. 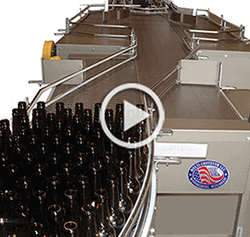 Multi-Conveyor is a Craft Brew Association Supplier Member. Watch this video - then let's get working on your new line or brewery expansion. Learn more.